May 22, 2013 By Tina M 70 Comments This post may contain affiliate links. Read my disclosure policy here. It’s funny what memories from our childhood stick with us into adulthood. When I was little I had a friend whose mom would receive the Oriental Trading magazine. I remember flipping through the pages and living in a dream world–wishing I could have everything on all of the pages! Now that I am a mom I receive that very magazine. Granted, it’s not quite as magical or mesmerizing to flip through as it was when I was a kid, but I still find myself intrigued with some of the bright, colorful and fun products. Being as obsessed as I have been lately with busy bags, I decided to see how many I could come up with using some fun Oriental Trading products. I love browsing through homemade busy bag ideas on various blogs, but something I’ve found is that a lot of them don’t seem very durable. Don’t get me wrong, I think it’s totally genius the ways moms utilize ordinary objects like toilet paper rolls and Pringle’s can to make various busy bags, but if I’m going to take the time to do a project like this, I want something that will last longer than a few uses. I had so much fun making these, but I made so many of them that I’m going to have to break them up into two separate posts. Tune in on Friday for more ideas (and if you haven’t already, subscribe to blog so you don’t miss future fun projects for the kids)! Okay….here they are! Tune in at the end of this post I’ll teach you how to make these as a group to make this very cost-effective. First up, we have the transportation foam shapes (you can also find these on Amazon). These are super fun and each shape comes in different sizes, so you can sort them from largest to smallest, smallest to largest, as well as by color. I also made a printable for sorting them by “land,” “water,” or “sky,” and then a separate car mat printable for free play. There are enough shapes that you could easily share them with friends and make about 10 busy bags. Next up we have the velcro craft sticks. When I ordered these I didn’t realize they were foam, which ended up having both pros and cons. The con is that wood probably holds up better, but the pro is that they are bendable making endless possibilities for different shapes! Attach the soft-sided velcro to both ends on one side of the craft stick, and the sticky side of the velcro to the opposite side. You can also buy wood craft sticks if you don’t want foam ones. These Nuts and Bolts make for another fun busy bag. If you make these as a group I wouldn’t make more than 6 sets from one package so that the kids have a good variety in each of the busy bags. I made some printables to go along with them so that they can practice sequencing by shapes and colors. I did however notice that some of the shapes aren’t quite the same size as the others so they don’t all screw on as nicely as others. My nephews were over today so I let them play around and test them out for me. They loved them! A few times they screwed them on too tightly and needed my help, but for the most part they could do it by themselves. Get the printables here: nuts and bolts printable If you are an Amazon-aholic, you can also find the Nuts and Bolts there. Little one had to join in on the fun (of course). These foam tie my shoes are one that you can divide up, or just put all six shoes in one busy bag. I might laminate mine to make them durable enough to last plenty of kids, but it’s probably not necessary. To increase the skill level for older kids, it might be fun to print out this chart of 26 ways to tie a shoe. It includes using multiple laces and everything. Next up are these giant buttons. You can use these for all sorts of things! Lacing, sorting, sequencing, etc. I got the lacing thread from Oriental Trading as well. If you get the thread, you can also use them with lacing cards and make two different busy bags with one purchase. You can find some cute (and free!) printable lacing cards on my Free Printables post. This set comes with a ton of buttons, you could probably make 6-8 bags with these. These can be found on Amazon as well. 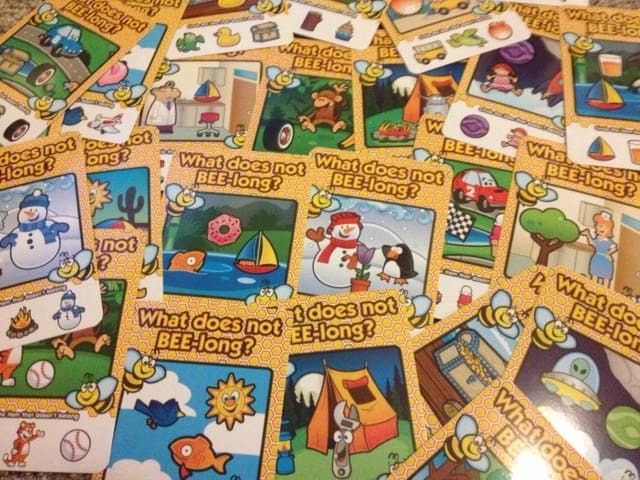 Last, I also ordered these “What Does Not Bee-long?” Activity Cards. They have a glossy covering on them so that kids can circle the correct answer with a dry erase marker. I will probably just use these on a magnet board like I did with the pom pom printables and use a magnet to choose the correct answer; but that’s just because I like to avoid putting markers in busy bags for younger kids. If you noticed, a lot of these products will make multiple busy bags. This makes things much more fun because you can make them with friends and split the cost. What I would do is decide which ones you want to do, then divide the cost up between the people you are inviting. Tell everyone what their portion of the cost is and then get together to put them all together! This also saves everyone from having to pay shipping on their own since one person would just make the purchase. Rather than spend $20 going out to dinner for a girl’s night, have everyone bring a food item and spend your $20 on a bunch of busy bags you can take home and use with your kids! I like to store my busy bag activities in pencil pouches, or these mini drawstring bags. Some of the activities work better in one or the other, so I like having both. Okay, now for the fun part. I want to giveaway some of these busy bags to my awesome readers! First is a contest for all the Oriental Trading products to make 10 different busy bags! To enter, see the instructions below. I also enjoy giveaways where you don’t have to do anything to enter (they don’t exist). So, if you are a subscriber to my blog, comment below stating which busy bag is your favorite and I will pick a bunch of you at random to send one to just as thanks for being you! What are your favorite busy bags? so fun! i love all these ideas. i want to go make them all for my little ones. i think my favorites are the counting links and the transportation activities. very cute! 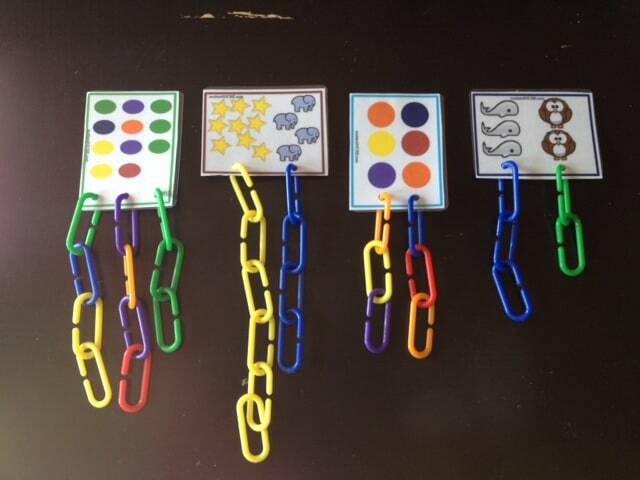 do you have the printables for the jumbo counting links somewhere that i can download? So cute! What a great idea! I love the paper doll foams!!! The transportation foams are so fun too. How fun to find your blog. I love these! I have 5 kids ages 1-16 and it can be so difficult to keep them all engaged! We especially have a difficult time in church…mot of the time we spend Sacrament Meeting out in the halls with the 3 yr old and 1 yr old. I definitely need to get some fun things like these! Shared on fb! Pinning now! 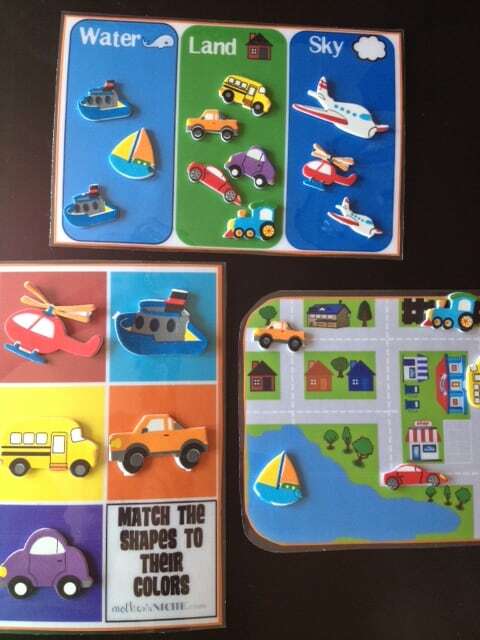 Love the transportation sorting busy bag- looks just like a sorting app my toddler loves to do! Tina! 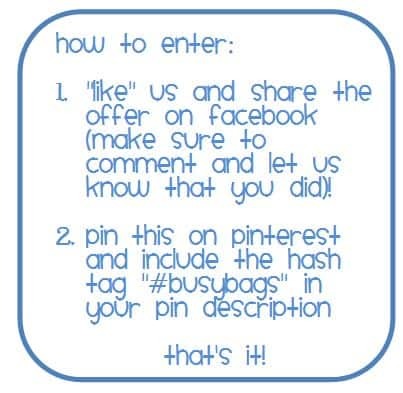 I have shared; I have pinned; I will be the luckiest if I win these because I love busy bags! Such a smart giveaway. I “liked” our site on FB and pinned it, too! I love making busy bags for my kids and love the ideas you shared. Thanks! I love your idea to buy the stuff from oriental trading. I’ve started making these for our church nursery and make a few of each kind. This is going to make my life easier. Thank you so much for sharing. Pinned on Pinterest and shared on Facebook. I shared on FB and I pinned!! Super excited! I pinned but I am not on Facebook. (Shocker, I know.) I just love that creative people like you make things available for the rest of us. Thanks a ton! I love the nuts and bolts set. I love all the ideas. Gonna try most of them!! Thank you!! Thanks so much for sharing your awesome free printables for busy bags! I featured your printables as the Free Printable(s) of the Day at the Living Montessori Now Facebook page https://www.facebook.com/LivingMontessoriNow (and on Pinterest). Shared on Fb! Such great ideas! I love your nuts and bolts!! LOVE this! where did you get your nuts & bolts set?? I teach Kindergarten at a school for bright kids with learning differences. 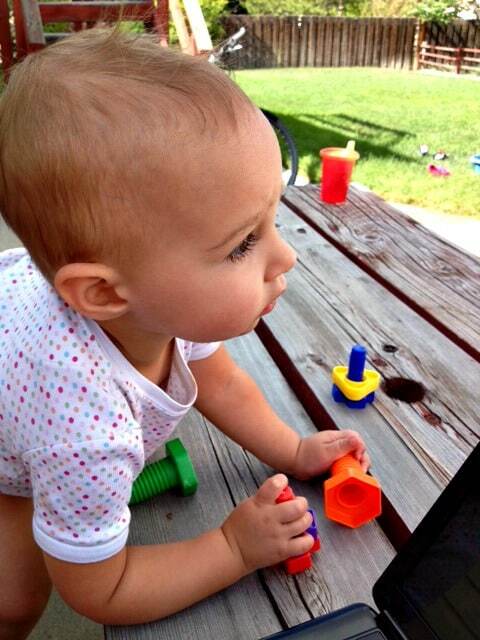 I am taking a Montessori training program online right now and am busy making activities this summer. I subscribed to your blog. I love your ideas and especially loved the transportation bag. Our school has a very large percentage of boys so they would love the transportation activity. Liked, shared, and pinned. : ) Fun ideas! Love, love, love your blog! Just found it today through Pinterest!! I “liked” your page on FB, subscribed to your blog and pinned it on Pinterest! Hoping I win!! My little guy would love these activities…especially the transportation one since he’s in love with cars these days! Tiffany, the contest had already ended when you entered, but I do have some transportation foams leftover and would love to send you some! Shoot me and email under the “contact” tab and send me your mailing address 🙂 Thanks for stopping by! Just wanted to pop by and let you know that you were one of my picks from last week’s Pin It Party! Pop over to the Pin It Party pinterest board and check out your pin! Hi was wondering where you bought the nuts and bolts ? Thanks! Hi Nicole! I got them from Oriental Trading. And you can also find them on Amazon. 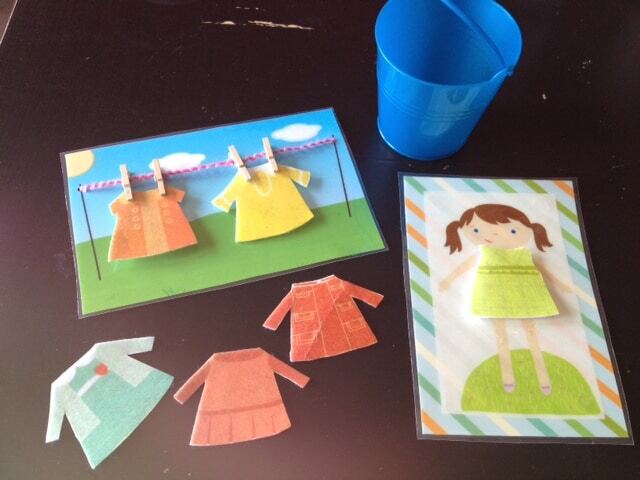 Thanks – these are great ideas and the printable images are perfect. I’m going to make some for my grandson. I see on the Nuts and Bolts printable that you put circles as one of the shapes. My bag of nuts and bolts didn’t come with circles. Did you have them use the hexagon? Dawn, Sorry…somehow I missed this comment. The cards with the circles are just for color recognition. I use the ones with the black shapes to practice shapes, and then the colored circles to practice colors. For example, “screw a blue one next to a red one, and then a yellow one” and it doesn’t matter which shape as long as the color matches. Sorry, I can see how that would be confusing. Thank you so much for your ideas and links! I’ve been searching the internet for these very resources you’ve linked to oriental trading. You’ve saved me so much time you can’t imagine. Thank you so much! As a preschool teacher, I love these ideas. 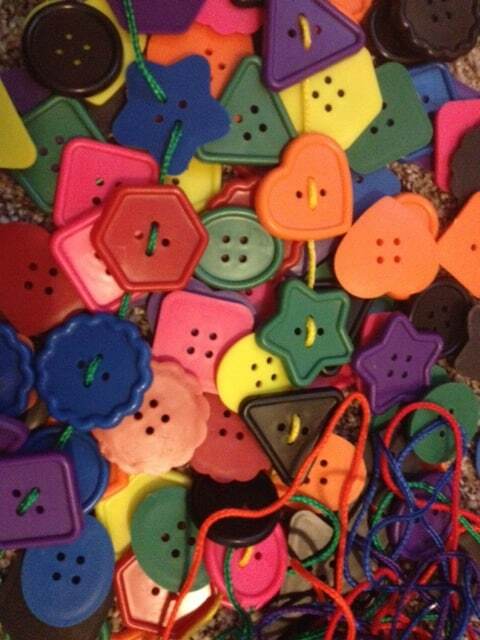 I have a set of the buttons that we play bingo with as well as lacing. It’s a wonderful rainy day activity. Love the transportation one. So fun and cute. Is one foam bag enough shapes for 10 busy bags? Also, since they are stickers are you just using the sticker adhesive to stick to the mats or something else? It seems like the adhesive would eventually lose its stickiness. Hi Savannah! Yes, it should be enough to make 10 busy bags. I left the adhesive paper on them. I didn’t want them to be sticky! Thank You, Thank You, Thank You! These are some fabulously fun ideas! I sure wish Oriental Trading still carried the: What does not belong cards sets!!! I would have loved to use clothes pins for choose which did not belong! ;(I am off to make some fun to a new grandbaby! I love the nuts and bolts busy bag. I found you today from money saving mom. I liked, shared, and pinned. I think the clotheline one is just darling–though they are all super cute! Think I’m going to host a busy bag party soon. I love your blog. I can’t see everything because od carnival cruise ship adds kept popping up over your blog. Oh no! that’s no good Christine! Thanks for the heads up, I will contact the network and get it removed! Were you viewing from a tablet? Love them all, but think my fav is the vehicle one. I have a home day care and the kids would love these. Always excited for new ideas!! Clicked on the link that says “click here to share” takes me to your page but not sure how to share it. Hope I did it right. I love the transportation bags,can’t seem to get the links to the printables to work…help! I like them all, but I especially like the shoe tying. Havent seen anything like it on any other site! Liked, shared & pinned! Thanks for sharing this! I love Oriental Trading Co too! These are amazing ideas!! I’m a preschool teacher so I’m always looking for new things to add to the classroom. 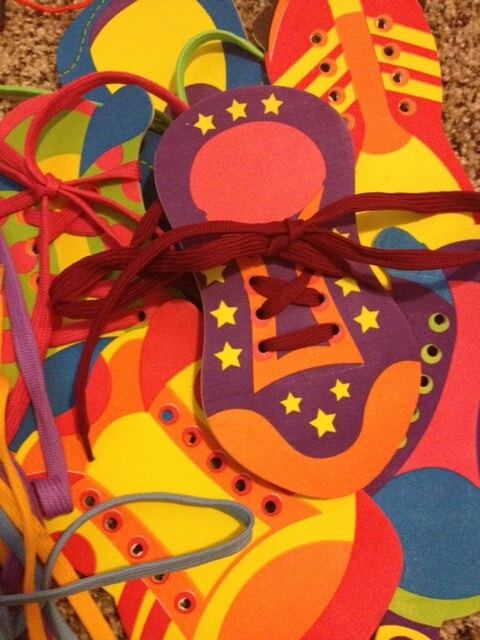 These are perfect for free play time, fun and educational! Thank You! Liking, pinning, and sharing right now! I love these busy bags. All of them are so cute, But I think I like the transportation bag. I think the little boats and cars are cute. The kiddos will love them. Is the give away open for international readers too or only USA residents? We absolutely love the big buttons. Cuteness overload. These bags are so great. A lot of inspiration right there. I have pinned ur post, hash tagged it and am now heading over to Facebook to like. I’ve been teaching teenagers, so I felt like I had forgotten how to teach littles through play. These ideas are great! Thank you ~SO MUCH~ for sharing!! 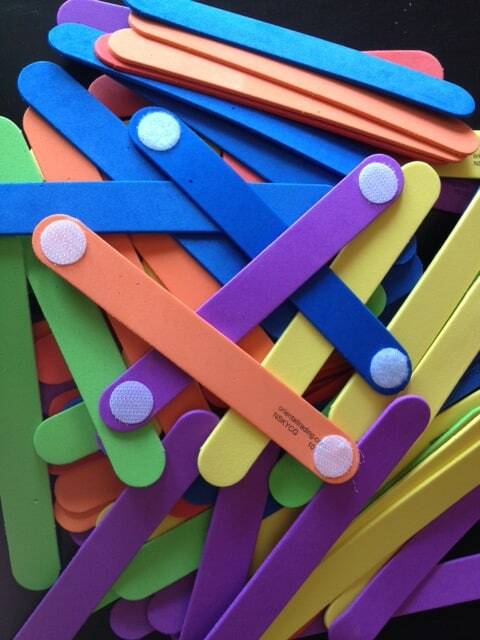 What size velcro did you use for the popsicle sticks and were the popsicle sticks jumbo size? Love these ideas!! Pinned and shared!! I love the foam tie my shoes. The pin pm match is great to. Really LOVE your awesome ideas!!! Greets from overseas!